Spanish politician and writer. He/She was born in Cádiz on September 7, 1832 and died in San Pedro de el Pinatar (Murcia). He/She was Professor of history of Spain before being elected President of the I Republic in 1874, characterized by his excellent oratory. On April 10, 1865 was in Madrid a strong confrontation between students and the security forces that left nine people dead and more than 100 injured. The students were protesting the dismissal of Emilio Castelar from his chair, because of the publication of the article the trait, which criticized the Queen. The incident was a symptom of the displeasure of large sectors of the population towards the repressive and reactionary policy of the Government. 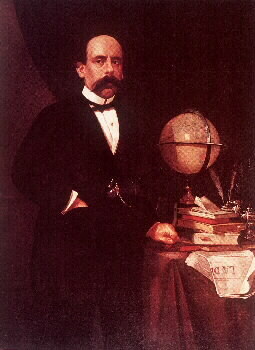 Emilio Castelar. (Detail of the monument). Madrid. On 2 January 1874 resumed the sessions of courts in Madrid; Emilio Castelar should explain his Government's policy since the sessions were suspended in September last year. During these months, he/she tried to win the trust of the radicals and the royalists, relying on the army to end the State of war that devastated the country. On the other hand, it softened the relations with the Church, deteriorated after the presentation in August of the previous year of a bill that provided for the separation of Church and State, as well as by the provisions of the draft constitutional, also presented in August, banning subsidies to the cult. Castelar decided to provide headquarters for Toledo, Sevilla and Tarragona, vacant since 1868, due to the fact that the Holy See had not recognized the right of patronage of Amadeo I. During his appearance in the Chamber, the political management of his Government was criticized and proposed a vote of confidence. On 3 January 1874 general Pavia, Castelar-appointed captain-general of Madrid, violently broke into Parliament and dissolved it when it was about to choose the doctor lever as new Prime Minister. Moments earlier, Castelar had lost the vote of confidence with 100 votes in favour and against 120. After the coup, general Pavia convened representatives of all parties, except for the cantonal and the Carlist, to form a unity Government. With this action it concluded the federal Republic. Since the restoration of the monarchy, Cánovas forbade any kind of Republican demonstration. The movement, on the other hand, was divided between a right-wing, led by Castelar, supporter of an attitude of collaboration with the regime, and a left wing, consisting of the federalists, advocates of a policy of revolutionary character. In August 1876, Salmeron traveled to Paris and was, along with Ruiz Zorrilla, the reformist Republican party. The 25th of this month published a manifesto which advocated the replantation of the Constitution of 1869 and the union of the interests of the middle class with the most popular. They also defended an administrative autonomy for municipalities and provinces that do not second-guessed the constitutional unit. In April 1879, in Madrid, the constitutional sagasta and the democratic progressives of Martos reach agreement with a view to the forthcoming elections by which they undertook to respect the best candidate located, leaving the rest of the election campaign. The agreement, which also joined the posibilistas of Castelar, was valid to all Spain except for Madrid, where every party would present candidates. It was also decided to create a directory in which included Sagasta and Romero Ortiz by the constitutional, Martos for the democratic progressives and Castelar by the posibilistas. A sector of the reformist Republican Party of Ruiz Zorrilla joined this initiative in the bosom of the democratic progressives. The rest of the party, however, opted for seclusion and initiated an approach the Federal of Figueras. The result of the elections of August 1881 was the confirmation of the political position of historical Republicans from Alemanes, a group that has defined himself as a Democrat and conservative, whose postulates not sought to challenge the national unity or social order. On October 30, 1883, historical Republican party in Madrid published a manifesto in which reaffirmed their positions in favor of adopting an organization of Republican character based on respect for individual rights and universal suffrage, and invested with the necessary powers to keep the social order. The party reaffirmed its support for the progressive measures that could raise the Liberal governments and praised the initiatives taken by the Government of Sagasta, in this sense: recognition of the right of Assembly and Association, freedom Chair, etc. 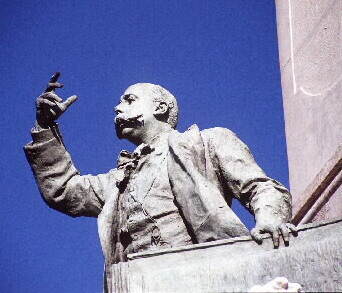 On February 8, 1888 the historic leader of the Republicans, Emilio Castelar, gave a parliamentary speech where disappeared its reservations with regard to the monarchy, which it declared compatible with civil liberties. The tone of this speech heralded the merger of his party with the Liberal of Sagasta. On December 11, 1892 Sagasta formed a Government in which the leaders of the main currents of the Liberal Party were represented. After the departure of Martos, Sagasta was able to re-establish discipline in his party and strengthened its position with the recent addition of the posibilistas of Castelar. The figure with more political weight of the Cabinet was the Minister of finance, Germán Gamazo, which had the support of Antonio Maura, appointed Minister of overseas. Castelar was the author of novels, among which stand out those of historical character, such as Ernesto (1855), Alfonso el Sabio (1856), Fra Filippo Lippi (1877), Nero (1891), civilization in the first five centuries of Christianity (1859) and memories of Italy (1872).